Septic tank can be located in various ways. The best one is to ask the home owner who should know where it is located. If that is not the case then there are few pointers to look for. First, the main building drain exit point should be found. Usually, the septic tank is no more than 10 feet away in a straight line from the exit point. Septic tanks are buried very close to a house to avoid unnecessary piping costs to a remote tank. It is also better because longer the pipe, bigger the chances are for pipe to break. In other cases when septic tank is not in a close proximity of the house, inserting the plumbing snake becomes an option. 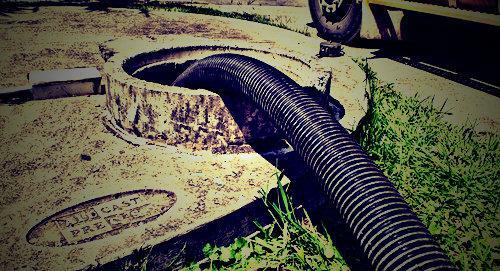 It is inserted in the main house drain and pushed till it stops, usually the snake end hitting the septic tank baffle. In that case the distance from the house has been determined and the septic tank location, too. Also one of the options is usage of radio transmitters and similar electronic devices. Those transmitters are used to pinpoint buried tank. Sometimes it can be thrown off a bit in case there are other metal pipes buried nearby, crossing or in parallel line with our sought-after pipeline. The experts in our team at MegaSeptic will locate your septic tank if there is no record of its location, taking various factors into account and using the modern technology equipment mentioned above. Once when it is located it will be properly checked and the owner properly advised what next steps will be.